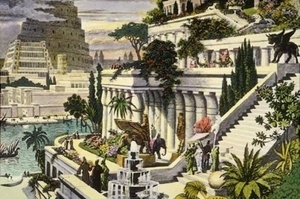 Babylon was the capital and chief city of the ancient Babylonian Empire. Not long after the Assyrians conquered the Kingdom of Israel, the Assyrian Empire began to crumble. Meanwhile, the Chaldeans and Babylonians began to gain strength. In 609 B.C. the Babylonians, in league with Egypt and Media, conquered Nineveh, the capital of Assyria. The Babylonian king at the time was Nabopolassar. Nebuchadnezzar was his son. The Babylonian Empire reached the height of its splendor and power under Nebuchadnezzar, who became king upon the death of his father. Using captive slaves from his conquests, Nebuchadnezzar launched into a building program that made the capital city of Babylon the greatest city in the world. Babylon stood in opposition to Israel and to righteousness. In three seiges, each one more violent than the one before, Babylon overtook Jerusalem and the Kingdom of Judah, and carried away its best and brightest citizens, while slaughtering others. The Book of Mormon account tells of a few who escaped to the American continent: Mulek, a son of King Zedekiah, and his associates; and Lehi, a prophet in Jerusalem, and his family and associates. Babylon fell suddenly to the Persians, reaping utter destruction. The golden age of the empire was short-lived—just over seventy years. When Christ comes again to rule on earth, "Babylon" will again fall, this time forever. All wickedness will be utterly destroyed when He comes. (See Second Coming.) Today, the Lord's servants are calling people to come forth out of Babylon, repent, and be saved. As it says in the Book of Revelation, "Babylon the Great, the mother of harlots and abominations of the earth" (Revelation 17:5), shall fall. An angel will proclaim the fall of Babylon: "Babylon is fallen, that great city, because she made all nations drink of the wine of the wrath of her fornication" (Revelation 14:8). ↑ Merrill F. Unger, Unger's Bible Dictionary, s.v. "Babylon," p. 116. ↑ Bible Encyclopedia, s.v. "Babylon," pp. 204-5. ↑ Bruce R. McConkie, Mormon Doctrine, Second Edition, "Babylon," p. 69. ↑ Our Original Heritage, The Story of Civilization, volume 1, p. 244. ↑ Old Testament Institute Manual, 1 Kings to Malachi, pp. 231-232. This page was last edited on 22 June 2011, at 14:37.